Meet or exceed ASME, Api, Mil-Standards And Customer Specific Project. “The Expertise in Fabrication And Repair Of Power Piping and Pressure Vessels” in Accordance With The Latest Editions and Addenda Of ASME Code Book. Wps, Por and Wpq are in accordance to ASME Section IX. 767 Mil-Standard Grade-A Nuclear work. George Fischer Ultra-Pure Water Systems. Quality Manufacturing Facility: Warwick’s 20,000 square foot fabrication plant allows us to create the exact assemblies necessary for any project. The plant is a collection of state-of-the-art cutting, drilling and welding equipment. It is much more productive to manufacture piping assemblies in this climate-controlled environment than it would ever be on a job site. Pioneering Innovation: Being on the cutting edge of technology allows us to be the leader in the most efficient processes for design and construction. Building Information Modeling (BIM) and prefabrication: Our computer technicians can manipulate piping, duct and air conditioning components through a three dimensional model. This allows Warwick’s technicians to route piping and duct before the walls and ceilings are in place and thus allow the fabrication process to begin. 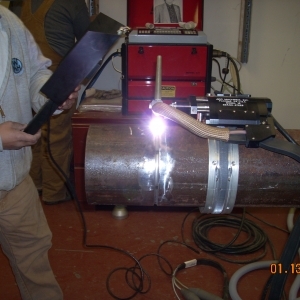 Highly Trained Experts: Our experience includes welders who are certified for specific procedures and are able to produce systems capable of nuclear grade A stainless steel piping, high pressure air, and nitrogen up to 5000 psi, 600 psi steam lines, and 3A sanitary piping for beverage and food processes.